"Crown Heights" and "Seven-Seventy" are used by Chabad Chassidim as code words. The Brooklyn neighbor­hood of Crown Heights is densely populated by Chabad­niks. "Seven-Seventy" is the heart of that neighborhood. 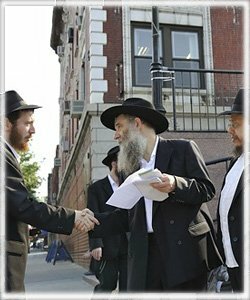 During the 1940's and 1950's Crown Heights was considered a respectable Jewish neighborhood. The Chabadniks, gathered around the previous Rebbe, lived in tran­quility and peace side by side with two hundred thousand other Jews, both religious and secular. In the 1960's the population began to change; the stable and quiet atmosphere was disrupted. This process was hastened by the riots of 1964, when burglary, theft and murder became more com­mon. Life in the neighborhood became quite dangerous, and people were afraid to leave their homes. At night, the side­walks were totally deserted, and the cars sped along the streets. Even in the daytime those who had to venture out­side to go to work or to shop tried to do it as quickly as pos­sible. People locked and bolted their doors. The Jews began to leave Crown Heights in search of a safer and more secure environment. People vacated their apartments, abandoned their stores. The neighborhood was being deserted. The empty homes were immediately taken over by the homeless. Eventually, the Chassidim also began to lose their nerve. "Rebbe, we can't go on like this," they said. "Let us gather the entire community and move someplace else." The Rebbe's reply was unexpected and, as usual, adamant: "Out of the question! We are staying. A Jew has no right to retreat before a gentile. A proud Jew does not run away, he digs in to defend his rights. If a Jew submits and concedes defeat, the gentile will hound him with redoubled zeal; but if a Jew stands firm, the gentile will yield and offer peace." The Rebbe added that any Jew who surrenders his home to a gentile in such a time bears responsibility for the fate of his neighbors. "This is always the case - in everything to do with the commandments, and with everyday life. It is the same here in Crown Heights as in the Land of Israel or in South Af­rica. This is the place where my father-in-law, of blessed memory, the previous Rebbe, the leader of our generation, lived and worked for ten years. Here is where he prayed and studied Torah with his Chassidim. We will never leave here, no matter what happens." Many years have passed since the Rebbe made his decision. In Crown Heights today, Chabadniks live side by side with their gentile neighbors. The number of Jews is steadily increasing. Stores display signs written in Hebrew, Yiddish, sometimes even Russian; the goods they sell are strictly kosher, under the supervision of the High Rabbinical Court of Crown Heights. Every corner has a synagogue, a mikveh, or a bookstore selling Jewish holy books. Even late at night, the streets are filled with Jews - this one carrying a book, another prayer shawl under his arm. Many of them are headed for "Seven-Seventy," the core of Crown Heights. Whites and blacks, Jews and gentiles all form an organic part of the overall picture, living side by side in fairly peace­ful coexistence and almost complete harmony. It should be noted that Chabadniks in general, and Crown Heights residents in particular, include people from all walks of contemporary life: scientists, doctors, busi­nessmen. However, the common denominator in their lives is their membership in Chabad-Lubavitch. Of course, the picture cannot be said to be free of all blemish. People still have to be on their guard. From time to time, Jews are still the victims of attacks, which can be quite vicious. Occasionally, a Jew comes home to find his apart­ment burglarized. However, compared to the years of panic before the Rebbe rejected the idea of running away, the neighborhood leads a quiet life. The Chabadniks, for their part, will certainly tell you that there is no other neighbor­hood like theirs in the entire world. For many years, there was a "town watch" of Chabad volunteers; recently, it was replaced by private police. Thus the Jews themselves are in charge of patrolling their area and maintaining order. On the surface, it may appear that people are en­grossed in their personal concerns, but in fact, the neighbor­hood's rhythm is set at "Seven-Seventy." When a farbren­gen or some other important event occurs, the Jews immedi­ately cancel their plans and put all other affairs aside, no matter how important they might seem. On holidays, especially Sukkot, the festivities over­flow into the city streets, and Crown Heights becomes truly unique. The police block traffic, and people dance in the streets from dawn until night. At such times, the area seems entirely Jewish. Magnificent processions take place during the last day of Pesach, on Lag Ba'Omer, and on Shavuot; the New York police keep order with the aid of helicopters. Crown Heights residents display unprecedented hos­pitality. Every week hundreds of Lubavitchers and newly initiated followers come from every comer of the world. During holidays, their numbers swell too many thousands. Crown Heights has no hotels capable of accommodating this mass of people. The guests are housed in the homes of Cha­badniks, who happily fulfill the commandment of hospital­ity at their own expense. It is not unusual to see several families from different countries, up to fifty people, seated around the same festive table. As soon as the guests come in, their hosts hurry to welcome, serve and feed them as if they were part of the family. All of this is done naturally, without any forced zeal, with joy that comes straight from the heart. This characterizes the spirit of Chabad, as taught by the Rebbe. Whoever comes is welcome, and every guest is received gladly. No one will pry into his private thoughts and affairs. Every Jew is cherished. How do the hosts man­age to receive so many guests? After all, they may have from ten to fifteen children of their own. Raising children is not easy, and supporting such large families is a formidable task. Praise G*d, they manage, because this too is part of the Rebbe's teaching: having children is more than a com­mandment - it is a privilege and a source of joy . You will always see happy, smiling faces in Crown Heights. When people have a leader and a clear purpose in life every prob­lem is surmountable.